Looking for private in-home or in-studio Banjo lessons? Our Weston teachers are ready to get you started. Find your teacher today! Check out some of our most popular teachers near Weston, MA including Boston, Cambridge, Brookline, Somerville and Lexington. Both Scruggs 3 finger Bluegrass & Frailing/Clawhammer styles are fun & challenging! No experience necessary! Whether you are 5, 25, or perhaps 85 years old when you make the decision to enter the world of music, you will be changing your life for the positive. eventual, inevitable joy you will achieve with your new friend. In a calm, easy going atmosphere you can expect to laugh a bit, as it is called 'playing music', as well as become focused & disciplined to succeed. You will learn to have an understanding of how to read & play a minimum of 3 songs each month, & will be picking up enough music theory as it applies to your instrument each week to feel confident & inspired to continue on as far as you desire. 'play well with others' in informal as well as more structured gatherings every few months, with no pressure, only compassion & encouragement. For those wishing to join in the fun of playing bluegrass music, we will start out with technique exercises, scales, basic melodies & accompaniment patterns to prepare you to learn this unique & exciting style of American music. There are many gatherings in the area called 'Pickin' Parties' that I want to get you ready to participate in as soon as is humanly possible. If you are one of those brave souls undertaking the lovely but challenging fretless instrument, the violin, my main focus is to get you started with the all the necessary basic techniques - holding the instrument & bow correctly, getting the best possible tone & pitch using efficiency & accuracy, mixed with a great deal of ear training & heart. Specific songs you'd like to learn? Your reward for accomplishing what I deem necessary on whichever instrument you've chosen will be for us to then listen to & analyze your desired piece, & I will then write it out in either tablature or standard notation. Lesson studio contains music stand, tuner, metronome, & there is easy parking in the well-lit front lot. The student must have own instrument & be willing to purchase necessary tools as recommended at their first lesson for their instrument & playing level, such as music stand, tuner, pick, book, strap, etc. at a local music store or online. It was a pleasure meeting Ms. Kelly today. She has a great personality and the lesson flew by. She was patient and her instructions were very helpful. I am looking forward to working with her as I learn to by the Banjo. Always fun, always new things to learn!!!! TakeLessons.com Instructor since 2005, Jason M. is now available for online lessons worldwide featuring multiple-camera angles and a share screen experience leaving no stone un-turned! Jason has been playing guitar for over 15 years and teaching music since 1996. Although trained in standard teaching methods, he has developed his own method of teaching to positively enhance the students strength, dexterity, ear-training, memorization and techniques. His goal as a teacher is specifically designed to help you achieve your goals as an artist and a musician. ting as hosted a recording clinic at the end of each day. Jason has host student showcases/charity benefits where his students were able to get on stage and show off their new talent and perform with other musicians. It wasn't mandatory though, if you were just looking to come out and support there was no pressure other than to come out and have fun. Jason has been transcribing for guitar and bass since the age of 18 and since then has become a master of the craft including both 5 line staff and tablature, hand-crafted exercises and deconstructions to better enhance the students learning. Artists and genres that Jason has experience with range from Classic Rock, Metallica, Slayer, Megadeth, Guns N' Roses, Santana, Jimi Hendrix, Eric Clapton, Led Zeppelin, Robert Johnson, Pierce the Veil, Paramore, All Time Low, Demi Lava to, Iron Maiden, Motorhead, Pantera, Avenged Sevenfold, The White Stripes, Green Day, Old Crow Medicine Show, Taylor Swift, Mumford and Sons, Bruno Mars, Rob Zombie, John 5, Audioslave, Rage Against the Machine, Van Morrison, the Beatles, AC/DC, ZZ-Top, Bullet For My Valentine, All That Remains, Ozzy, Black Label Society, Sublime, Aerosmith, At the Drive In, Type O Negative, the Black Keys, the Pixies, the Toadies, Black Sabbath, Jason Mraz, Lady GaGa, John Mayer and Journey. Jason attended the University of Alaska, Anchorage where his degree is in Music and Business. He is constantly continuing his education with music theory courses as well as private guitar instruction. He attends guitar workshops and seminars by artists such as John5 and Kerry King who are known as some of the worlds finest guitar players. He reviews every day from a wide range of over 1000 sources working to become a better musician and instructor. Another nice feature that you might enjoy from one on one sessions with Jason is learning the ability to craft and record your own songs using state of the art technology that caters to your own unique personality. There are no limits! Jason teaches all experience levels from beginner to intermediate and advanced as well as artists that are signed to labels. Local news outlet Fox 5 did a segment with one of his students who overcame issues with ADD and depression as a result of taking guitar lessons. His students advance quickly, some have released albums, been in Guitar World Magazine as well as its online companion and won awards for their music websites. Lessons are scheduled to best fit to the student's schedule when possible. Students receive complimentary audio lessons and transcriptions of songs upon their first or second session. Jason is a very patient instructor and understands that students learn at a different pace, after all everyone is an individual. Various guitars depending on project or mood. Jason is a amazing teacher. He is very patient and really has passion for the music. Also like his voice and very enjoyed his lessons. Awesome! Great attitude and instruction. My son and I were in the lessson and it was great. I have my degree from The Eastman School of Music and have played rock and roll for decades. My joy is bringing people to music and music playing. As Music is an infinite language it has always been an eternal joy to teach and relate to my beloved students what music can say to them and what they can convey to others. "If music is not fun it is useless" I urge my students to play their instruments not practice! I will teach music theory as I teach you any style or all styles. Patience is the key and I am constantly filled with it. You will progress as you learn the ins and outs of your instrument and music. Room setup for lessons, with small keyboard and instruments. Ample parking available, parents can sit in on lessons and waiting area available. expected to provide the instrument including full keyboard or piano. Cameron didn’t like his lesson, he LOVED it. It was his first lesson and Phil was extremely patient. He’s looking forward to future lessons and promises to practice! Thank you, Phil, we think we have a winner that will hopefully take time away from video games. 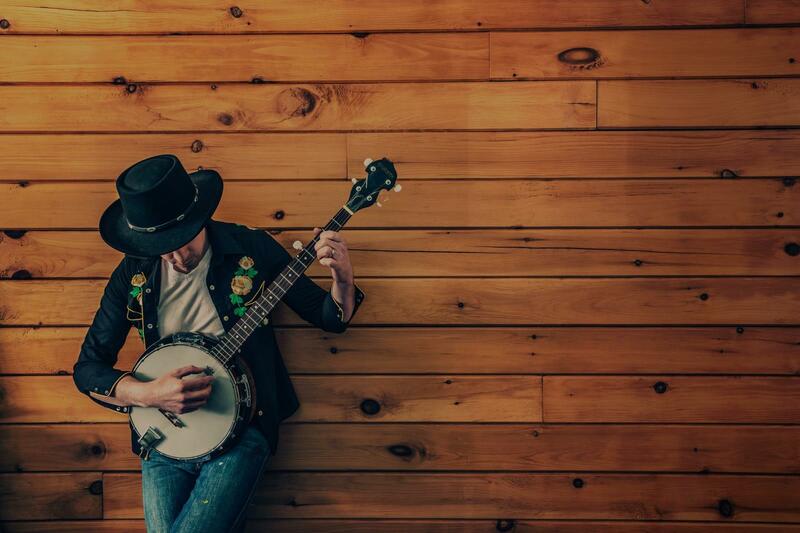 If country picking, blue grass, or even pop/rock is a favorite of yours then banjo is a really fun instrument to learn. As with all instruments I teach, we would start with basics and in no time the be picking and strumming away on songs you love. I also incorporate learning the notes, chords, theory, and picking, strumming, techniques and rhythms to become a well rounded musician. I have been playing and teaching banjo since 2006, and I'm always very excited to introduce new students to this unique instrument. I focus on the "Scruggs-style" method of playing 5-string banjo, and we'll work on techniques used in common bluegrass and folk tunes. As you advance, I'll help you in creating your own banjo solo breaks. - Degree in Music Theory / History from University of Wisconsin - Whitewater. - 25 years' teaching and performing experience. - Fluent in all electric styles, plus acoustic and classical. I like to cover the fundamentals while focusing on your personal goals. All stages of ability are welcome, from rank novice to pro. We'll determine what you wish to learn, and build a roadmap to get there. Home Office in his Townhouse: Music stand, recording equipment, two chairs. All types of jazz, from swing to modern. Rock, Metal, Blues and Country. Composition and improvisation. So far so good. Very patient as mistakes after mistake was made. Corrected quite a few mistakes I was making so that my habits would be good habits from the start. Let me talk to myself as I messed up and complimented me when I was on the right track. Fun instrument for which I focus on the claw hammer technique and Earl Scruggs style rolls. In addition to being a Berklee College of Music Graduate, I have a Masters in Music Education, and currently completing my Doctorate in Music Education from Boston University, I have been playing for over 30 years. Lessons are written and tailored to you. I use music, printouts, and instructional material to make sure you progress as you should. I have spots available every day of the week, so I'm confident that we can find something that works for both of us. I know that learning to play any style of music whether it be Jazz, Blues, Soul, Motown, Funk, or Rock is a challenge, but with help from an experienced educator, your instrument becomes a rewarding lifelong enjoyment. Please feel free to contact me. I would be happy to speak with you regarding any questions you may have. It's so rewarding to meet a teacher on the same page with me. Very personable, knowledgable and sets direction/goals clearly. I enjoy my song writing coach Frankie. His knowledge and patience was well appreciated. Frankie tailors each music lesson to my needs and interests, while sharing his extensive knowlege of music, theory, and playing technique. I have enjoyed each lesson over past 8 years, as he has encouraged me to grow and develop my own knowledge and skill. An excellent instructor! Dillon C., a San Diego native, has been studying guitar since age 11. He began gigging professionally with local rock groups at age 14 and became interested in jazz while in high school where he played in the La Costa Canyon High School Jazz Band. In 2009, his rock group, The New Archaic, won Best New Artist at the San Diego Music Awards and were nominated for Best Alternative Album in 2010.
t the 2011 San Diego Music Awards and nominated for the same award in 2013. The group has opened for national and international acts like the Mattson 2, Budos Band, Sierre Leone Refugee All-Stars, and Zongo Junction. Dillon began teaching while still in high school, where he taught the Magdalena YMCA group guitar classes. He has also been teaching privately since then as well as at the Encinitas School of Music and Electric Ladyland Music School in Ocean Beach. He focuses on learning chords and songs, developing rhythm, proper technique, an understanding of theory and composition, all while making the lessons fun and interesting for the student. All you need to be prepared on our first lesson is your guitar (acoustic or electric) and a folder for lesson materials. If you are doing piano lessons you will need a folder for lesson materials only. I will provide a keyboard for you. Options for lesson times are 30, 45, or 60 minute lessons. I start beginner students with some great introductory chords and songs and use these as a platform to develop technique. As you progress, we will get into more challenging songs, learn about music theory (scales, keys, improvisation) and will also learn about composing songs. Dillon is a first rate guitar instructor! I've taken lessons with Dillon for 5 months, and he has helped me make tremendous progress. I was lucky to find Dillon because my music interests are all over the place. I wanted to learn about fingerstyle, soul, jazz, blues, Latin music, music theory, transcribing for bands. Dillon helped me with all of those. He's the kind of person whose has really studied the guitar and can distill the music from many styles into a few simple ideas for the guitar, and explain those ideas in a memorable way. I'll continue taking lessons from him, and would recommend him as a teacher to anyone looking for a teacher with charisma. Dillon is an absolutely amazing teacher. I just started playing the piano a few months ago and he has been instrumental in motivating me and giving me the tools I need to get started. He is always willing to switch it up each lesson depending on how I am feeling that week and I really enjoy working with him. Dillon is extremely talented and dedicated to music which is really great, because starting out can be hard. I would highly recommend Dillon to anyone! Dillon- was not reliable. He no-showed twice and his phone was not active. Not a good start for beginner student! 5 string banjo Skruggs style bluegrass. I have tons of experience and formal university training in music education. I know how to take the complex and make it simple. There are very good reasons my students rise to the top. Experience makes a difference, and I have more professional teaching experience than 99% of other instructors. Learning the best way, helps you learn faster and have fun while you succeed! Mel is a great teacher and his many past experiences in the music field have given him tons of knowledge. he has a simple and effective way of teaching music and theory. he listens to the way you learn and adapts his methods to best suit you. Mel is a very patient and knowledgable teacher. I feel like I fumble along at the beginning of a lesson but by the end Mel has improved my technique and timing. I would definitely recommend Mel to anyone who wants to learn or improve on their instrument! Mel is a great listener. My first lesson was great. Banjo is my primary instrument. We can do old-time clawhammer or 3-finger bluegrass! I teach 3-finger, 5-string banjo. My teaching style is fairly methodical and aimed to develop strong technique and musicianship. Students will use traditional bluegrass to build solid tone production and right hand technique. It is also important to develop the music theory required to understand how melodies and songs are constructed. I focus on using traditional tunes to exercise deeper musical ideas and technique, rather than learning song after song. I also push my students to get involved in the Boston bluegrass community, finding jams to suit their skill level. I have been playing music since the age of four, from nationally competing string quartets to jazz combos to Balkan folk music, but devote the vast majority of my time to bluegrass banjo these days. I was a 2017 FreshGrass Banjo Award finalist and play in several folk and bluegrass bands around Boston. I started off with violin at the age of four, and picked up mandolin, guitar, and banjo in my teens. I focused on small ensemble playing, especially competitive string quartet. I bounced around from band to band and touched a lot of different genres. Classical gave me extremely solid technical foundations and practice methods, jazz gave me music theory, I learned rhythm from transcribing math rock guitar solos. I started playing folk music with a Klezmer band on the streets of Chicago -- my first experience making money with music. From there, I branched out into Balkan, Irish, and American folk. As I got older, my interest in the banjo became an obsession as I discovered players like Noam Pikelny, Jens Kruger, and Wes Corbett. I ultimately ended up devoting the majority of my energy to it and it has become my primary instrument. FreshGrass Banjo Award finalist in 2017, and you can find some videos of my playing on jameshanford.org. Can't find a teacher in Weston, MA? "It's so rewarding to meet a teacher on the same page with me. Very personable, knowledgable and sets direction/goals clearly." Boston, MA teacher: Frankie P.
"Great instructor. Explains things clearly. A pleasure taking the lessons each week." and had a clear plan to help me begin to learn to play the banjo and understand why I am playing what I'm playing. I'm looking forward to practicing and seeing where this all goes."